In the years I’ve been privileged to be associated with the rabbit industry, I’ve come to realize that in our lives we are destined to make many choices. Some choices determine what jobs we will pursue; others determine our life-styles and use of leisure time, while still others centre around our favourite hobby - breeding rabbits. Finding the right direction”is the first requirement for future success. This often involves the selection of the right breeds to suit our own particular likes and needs, identifying markets available for breeding stock and fryers, and learning how to select the best replacements. In addition to the social contacts, and friendly competition evident at most rabbit functions, the true measure of success is how close we can breed rabbits to the standard of perfection. With rabbits, as with other species, it’s necessary to make progress or stand aside. Darwin’s laws of evolution dictate this. All living things must first adjust to their environment and then improve at a rate equal to, or better than, their ancestors or fade away to be replaced by a more progressive species. In any breeding program, fanciers should work toward selecting replacement bucks and does that will equal or surpass their parents; otherwise no headway will be made. Observations over the years lead me to believe that there has been a tremendous loss of top quality genetic stock. 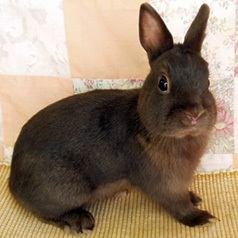 Oftentimes a particular breeder who has done a wonderful job of perfecting a breed of rabbits finds it necessary to dispose of his/her stock for legitimate reasons. The stock often doesn’t get transferred to another serious breeder, and a loss of genetic material results. New fanciers enter the scene and proceed to ‘re-invent the wheel over and over again without perhaps ever getting it as good as it was before. This produces a loss of valuable time and breeding stock. In many ways the beautiful New Zealand Red suffers from this roller coaster ride. However, on the positive side, there are individuals in all breeds that I believe are better than any in the past and a serious attempt should be made by new and established fanciers to acquire stock that is at as high a level of perfection as possible to enable a sense of completion, perfection and satisfaction in a reasonable length of time. There will always be lots of fine-tuning to do on any breed, no matter how good it may be at the start. 1) When purchasing your initial stock, check around and select from one source or line (ideally line-bred). This might involve one buck and three does, or two bucks and eight does. Proceed to get a good one year ‘genetic impression’of what the strain has to offer. This simply means applying good management and nutrition practices and raising four or five litters per doe in the first year and evaluating the results. If the line is working, then only add new blood through purchased does. However, the purchase of a buck may become necessary if some real quality aspects are lacking in the original stock. 2) Avoid purchasing stock that is just average all over. It’s better to select animals with outstanding merit even though they may have a few outstanding faults (as long as these are not disqualifying faults). In looking back, the best breeding buck I’ve had the privilege to own was an example of this. This was a black Dutch buck that had heavy cheek markings and a somewhat narrow blaze, but the rest of his markings, fur and type were outstanding. Does were selected for him that had ideal’ cheeks. Many of the resultant offspring fared very well on the show table. 3) Try never to mate individuals with the same faults together. Often you will need to keep three bucks for every twelve does to accomplish this. An example would be if the doe has weak lower hip development, then mate her with a buck that is very full in this area. Make every mating with the desire and hope that the offspring will be an improvement on the parents. Remember, selecting for too many things at once is often not possible. Put emphasis on what you have to control in your herd and learn what traits partially take care of themselves. In the meat breeds, place emphasis on high, wide loins, depth of body, firm flesh and the ability to prime a coat with lesser breeding pressure on head, ears, size, and shoulders. 4) Never keep replacement stock from a mediocre litter. Try to select from a litter where the quality runs deep, because genetic quality comes from the majority. Let’s say there is an outstanding buck in a litter of eight with two so-so and five poor ones. Chances are the buck will breed towards the majority or average of the litter, which in this case would be less than satisfactory. In another example, with a good buck, selected from a litter of eight, where seven were very good and there was one poor one, this buck will likely outbreed himself’or breed ‘better and more consistently than he looks’. An additional point to remember is that a rabbit tends to be the average of its parents’ type and will usually breed 50% towards its immediate parents and 50% towards the collection of its grandparents. 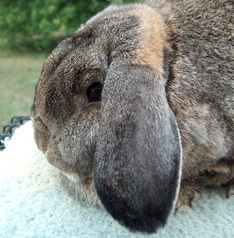 5) Sometimes breeding two outstanding rabbits together will only produce meat or pet rabbits. You shake your head ‘WHY? There just simply wasn’t a “genetic nick”. This will more often happen from crossing two unrelated lines. The secret is to start with stock that carries the desirable dominant genetic make-up with as few of the undesirable recessive genes as possible. The genetic make-up in any individual is in its produce and not necessarily in the visual conformity. a) The phenotype (visual) tells us what the rabbit APPEARS to be. c) The genotype (progeny - what the rabbit produces) tells us what the rabbit ACTUALLY is. Note: Breeding and showing sheep, rabbits and chickens for most of his life, William (Bill) Gardhouse is one of those ‘master breeders’ who is very generous with passing on his experience and his knowledge. This article is taken from a DRCBA bulletin (May/June 1986) and although written for the rabbit fancier, can be applied to the breeding of many other animals. 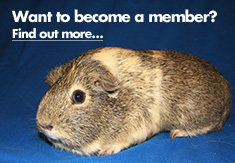 Bill is a life member and judge of the DRCBA.